Chicken satay is the Thai version of fast food, found in every street market and Thai restaurant. It can be served as a starter, buffet, snack or as a wonderful main course with the addition of salad leaves. First make the satay sticks. Place the lemon grass, ginger, coriander seeds and fresh coriander in a food processor and pulse until roughly chopped. Add the chicken and soya sauce and process for a few seconds more until mixed together and the chicken is coarsely chopped. Place the chicken mixture in a bowl, cover and place in the fridge for 1 hour or preferably overnight until it becomes firm. Using wet hands, divide the mixture into 8-10 portions and shape into 'sausages' along wooden skewers, pressing down to flatten each one a little. Place under a preheated grill on a preheated griddle pan or barbecue, and cook for 10-15 minutes, turning occasionally, until the chicken is golden brown and thoroughly cooked. The juices should run clear and there should be no pink meat remaining. Meanwhile, make the satay sauce. Place all the ingredients in a food processor and mix until smooth. Pour into a pan and simmer gently for 15 minutes or until beginning to thicken. 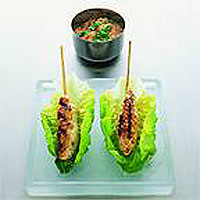 Serve the satay skewers on little gem lettuce leaves and the warm satay sauce in a separate bowl for dipping. Soak the skewers in cold water for 30 minutes before use to stop them scorching.The satay sauce can be made the day before, covered and stored in the fridge. Reheat gently in a pan for 4-5 minutes before serving. For a chunkier sauce, process for less time.